Creating our glass sculpture begins with a thought, idea, and concept of direction. I develop these thoughts and ideas in a number of ways before actually creating them in glass. Almost everything I make has had its origin in the form of simple quick sketches on paper. These quick sketches may be derived from a past glass sculpture series I want to explore further. Sometimes these quick sketches open the door to new ideas and direction… And sometimes these sketches are attempts to resolve ongoing concepts. Volume can be hard to visualize in quick 2-dimensional sketches. This is where creating small 3-dimentional sketches from clay become important. Creating small clay “maquettes” allows me to visualize the depth along with the height and width. I can see how light and shadows may potentially play a part in the final glass sculpture. The overall composition and interaction between the forms can be worked out with the clay. Making larger work from blown glass usually involves a team of glassblowers working together. Good communication within the glassblowing team before and during the process is very important. Using 2-dimensional drawings are useful in conveying ideas… However, having a 3-dimensional clay maquette helps communicate the idea or form more clearly. 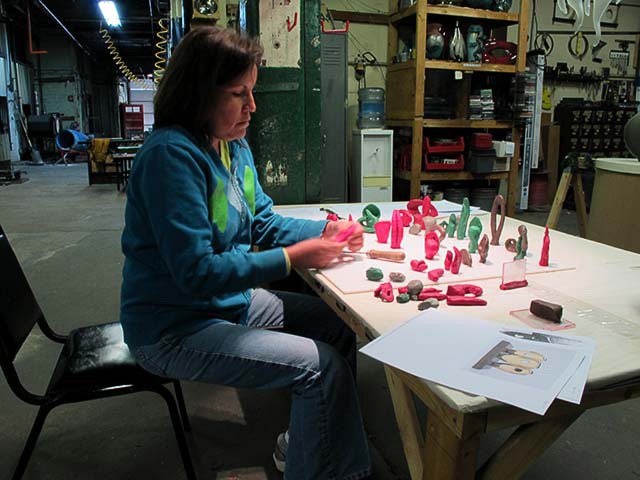 Using clay sketches allows the glassblowing team to more easily plan the various steps while working with the hot glass. The clay sketches and 2-dimensional drawings are used as road maps, giving potential direction for ideas, thoughts, and concepts. The clay sketches and 2-dimensional drawings are important aspects in the design process… But the glass has a life of its own and may decide to change the direction of the road map for the glass sculpture. This short video clip is just a small glimpse into our creative process in making glass sculpture.